I bribe my children. I give them money and prizes to do things I'd like them to do and it's worked out really well for us. 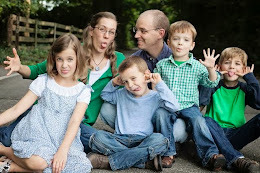 Before you call me a terrible mom, here are the reasons I do. Kids respond to rewards and punishments. Yes, I'd like them to eventually move past this so that they do things for intrinsic reasons, but for now my children are at the stage of life where there actions are very much a product of the punishments and rewards offered them, especially when it comes to doing hard things. When I give my kids an incentive to do something, they know it's really important to me. Every summer I give my kids an incentive to read. We do a summer reading chart every year where they earn prizes, and their grandma also gives them a chart to fill out and she pays them $20 when it's full. My kids know reading is very important to us. But in the process of doing all that reading during the summer to win those prizes, my kids gain a love of reading. The more they read, the easier it gets, and the more enjoyable it becomes. So even though their reading began as a way to get those prizes (a very behavioristic approach), they now see the value of it and read a lot of books on their own, without prizes. These things are important to me and I feel like giving them an extra incentive to do these things, other than "because mom and dad said so", gives them the push they need. As a young mom taking my 5, 3 and 1 year old to the grocery store by myself, I would often bribe my kids with a cookie afterward or a ride on the mechanical horse if they would stay close to me and not scream and throw fits, and honestly I don't feel too bad about that because I was trying to stay sane and that's what it took. But now there is nothing that drives me crazier than hearing my kids ask "If we're good at the grocery store can we have a treat?" or "If we're good at the clothing store can we go to the toy store?" And I tell them "No. You will be good because that is how I expect you to behave in public places." I have learned to have higher expectations, and if they misbehave they know there will be consequences. Bribes give kids an extra push to help them do something they are reluctant to do or forget to do, but once the goal has been achieved or the habit started the outward incentive should stop. Then the kids will hopefully continue to keep the behavior for intrinsic reasons. When the kids were little we had a list of table manners and the kids earned stickers at each meal for good behavior. When the charts were filled up and the rewards claimed, we no longer continued that incentive but expected the kids to have good table manners just because. And actually they have terrible table manners. But we're still working on it. There's nothing more annoying then a child who thinks they should always get a reward when he does something. My kids have been guilty of this. And it annoys me. That's when I know I need to cut back on the incentives. When Joshua was little he was terrified of performing in front of other people. Whenever the children at church would stand up in the front to sing a song for their parents, he would refuse to go up. The children at church perform a special program every year and he always refused to go up and participate. Then one year when he was 6 I thought he would finally get up. He had practiced with them and had told me he was going to do it, but when it was time to go up he freaked out and refused. I was not going to make him get up there, but I offered him $5 to just go up and try. That was enough of an incentive to push him past his fear and get on stage. His sister was also up on there performing, and she did not get $5 to participate, and she probably didn't think that was fair. It gave us an opportunity to talk about how life is not fair and different people have different needs. He needed a push, she didn't. Sometimes it will be the other way around. Ever since he got over his initial fear he has thrived being on stage and performed in several plays. I'd say that $5 was a great investment. Don't bribe kids for things they can't control. If you want them to be in a play, give them an incentive to try out, but don't make it dependent on whether or not they get the part. They can't control that. Same goes with sports. It doesn't make sense to bribe a child to score a goal when that child may asked by the coach to focus more on defense. Give incentives to help your child push themselves and get out of their comfort zones but not for specific achievements that are not in their control. Yes. Well, I think it does. My goal in giving my kids incentives is to encourage them to learn things and do things that I think are important and hope that they will continue to do it once the bribe is over. And I've been thinking about the bribes I give my kids because of an experience that happened this past week. Music has always been very important to me and I wanted my kids to experience how uplifting church music can be when we play it. Last summer I told the kids that for every hymn they learned to play on the piano I would give them $5. Joshua has been the most responsive to this bribe. He has since passed off 9 songs and earned himself $45. We won't continue this bribe forever since the hymns won't be as much of a challenge as his skills improve, but for now it's working well. One day this past week he came home from school kind of grumpy. After letting him have some time to himself (this boy needs space sometimes) I asked him how his day had been. He said he had been feeling grumpy, but then he went and played some hymns on the piano and music always made him feel better, so he was doing okay now. Hallelujah! I tell you that $45 was worth every penny. It brought tears to my eyes when he said that. So there are my thoughts on incentives and parenting. What do you think? 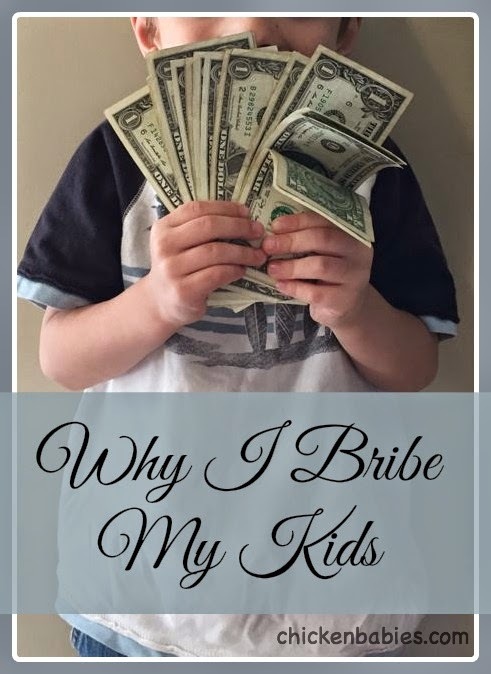 Do you bribe your kids? Personally (and as a psychologist, so I guess also professionally, lol), I'm very anti-bribe, but I appreciate that you are making this a positive experience for your children and not resorting to negative reinforcement. I think it's also good to point out that the "bribe" is in the eye of the beholder. For some parents, they hand over money - for some, it's "we'll stop for ice cream after music class if you do X." Thanks for the comment Jennifer! I'd be interested to her your thoughts (personally and professionally) against bribing. :) And I agree the word "bribe" can mean different things to different people. Hey Erin. Love your blog by the way. Was on here looking for the Lego happy home thing again to copy and saw this. I just wanted to let you know that you should feel very good about your reward system. It is basically exactly the model that Johns Hopkins uses in their pediatric feeding clinic and they have the best results in the country. Will had to go through the program two years ago and they trained me to do this not only with meals but for all behaviors. The head if the Yale parenting center prescribes the same method (Dr Alan Kazdin-- he has great parenting books, too, describing the science behind it). Technically it's not a bribe if you notify kids of the reward before the experience begins (ie before you enter the grocery store for eg); it's an incentive. In short, the research shows that what you are instinctively doing is the best way to shape kids' behavior, even down to the gradual fade-out as they become habituated. Basically, you are an amazing mom. I hope Jason knows how lucky he is!